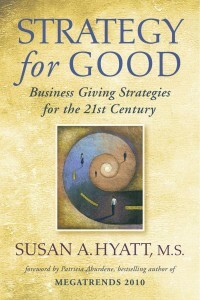 Corona Insights is thrilled to be one of the socially responsible companies featured in a new book, Strategy for Good, by Susan Hyatt, founder and CEO of Business Nonprofit CONNECTIONS, Inc.
Strategy for Good uses real-world examples to illustrate “how to create all-win solutions that demonstrate your [company’s] values, benefit the causes you care most about, and boost your profitability.” As the book describes, community involvement is now a “must do” for businesses and can be used strategically. Corona Insights is proud of their long track-record of community involvement. From philanthropy to volunteerism, Coronitas believe strongly in our community partnerships and the importance of giving back. We enjoy sharing our expertise through board service, presentations and membership organizations, as well as giving our time outside the office.